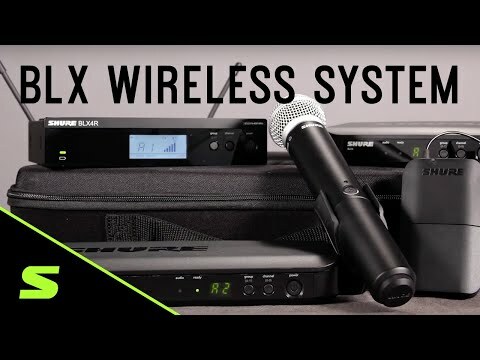 The BLX-R range of Shure wireless systems are the most affordable, rackmountable wireless systems in the Shure portfolio. The BLX24R/SM58 si.. The BLX-R range of Shure wireless systems are the most affordable, rackmountable wireless systems in the Shure portfolio. The BLX24R/SM58 single channel system offers a single rackmount receiver along side the SM58 hand-held transmitter. Precision built to the same requirements as higher end Shure wireless systems. Utilising an advanced LCD display and simple set-up and an easy to use interace for long lasting performance that you rely on. The Industry-Standard Shure SM58 is here in the form of it's wireless cousin, but with nearly identical dynamic performance and frequency response of the original wired version. It's response between 50 - 15,000 Hz is tuned to accentuate the warmth and clarity of lead and backing vocals.